Italy forged ahead with plans to send hundreds of migrants to Spain in a small naval convoy on Tuesday (12 June) after shutting its own ports to them, sparking a war of words with France that exposed EU tensions over immigration. Some 629 migrants, including 11 children and seven pregnant women, have been afloat in the central Mediterranean aboard the Aquarius rescue ship since Sunday, when both Italy and Malta refused to let them dock. Spain unexpectedly offered on Monday to take in the group of mainly sub-Saharan Africans, who were picked up off the Libyan coast over the weekend. But the Aquarius is heavily overcrowded, making the four-day trip to Spain particularly perilous. To overcome the problem, two Italian boats moved alongside the Aquarius on Tuesday to share out the migrants before heading west through what are predicted to be stormy seas. Meanwhile the only charity vessel left to patrol off the coast of Libya — a staging ground for people smugglers — said a migrant shipwreck had claimed at least 12 lives. It will take the Aquarius about 10 days to make the trip to Spain and back, leaving the Dutch-flagged Sea Watch 3 alone off the coast of Libya looking for migrants. A US Navy ship, Trenton, radioed Sea Watch on Tuesday to say it had picked up 12 bodies and 41 survivors from a sinking rubber boat. 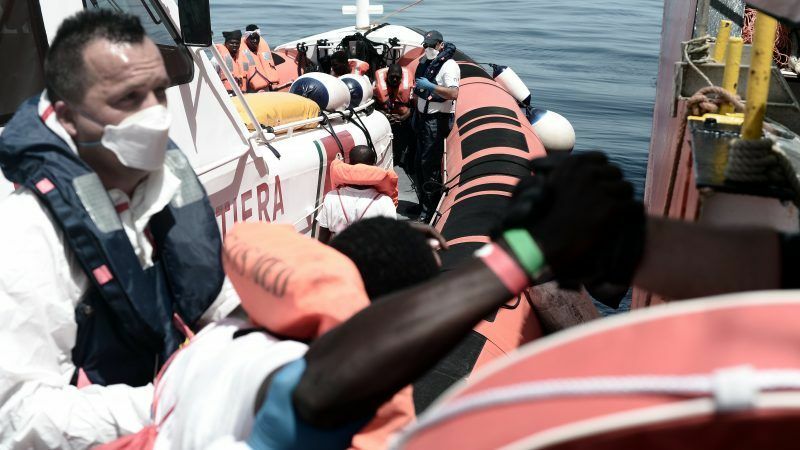 “This shows what happens when there are not enough rescue assets at sea,” said Sea Watch spokesman Ruben Neugebauer. Italy has taken in more than 640,000 mainly African migrants over the past five years. Other EU states have largely ignored pleas by Rome to take in some of the newcomers and share the cost of their care, heightening anti-European and anti-migrant sentiment in Italy. Matteo Salvini, Italy’s new interior minister and head of the far-right League, has said his move this week is aimed at forcing other European states to help bear the strain. However, French President Emmanuel Macron denounced the decision to block the Aquarius, saying that under international law Italy should have taken the migrants in. “There is a degree of cynicism and irresponsibility in the Italian government’s behaviour with regards to this dramatic humanitarian situation,” government spokesman Benjamin Griveaux quoted Macron as telling his cabinet. Italian Prime Minister Giuseppe Conte responded angrily. “Italy cannot accept hypocritical lessons from countries that have always preferred to turn their backs when it comes to immigration,” Conte said in a statement. Italy also received backing from Hungary’s right-wing Prime Minister Viktor Orbán, who is a friend of Salvini and is known for his fiercely anti-immigrant rhetoric. The Sea Watch met the Trenton and was asked to pick up the survivors and bodies, but the group refused to bring them on board without a written guarantee from Italy. 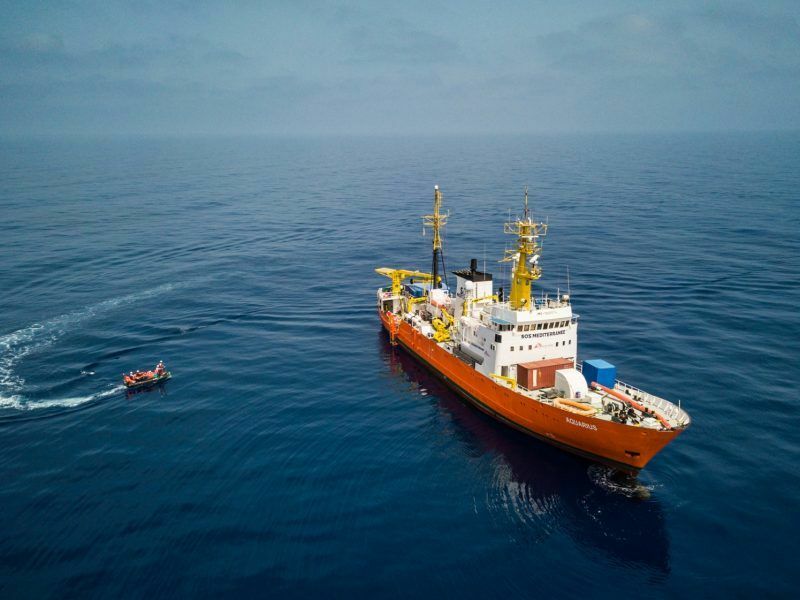 Doctors Without Borders (MSF), which is operating the Aquarius alongside SOS Mediterranne, urged Rome to drop plans for the lengthy trip to Spain for its migrant passengers. Salvini’s League scored its best-ever result in March national elections, partly on pledges to deport hundreds of thousands of migrants and halt the flow of newcomers, and has formed a coalition with the anti-system 5-Star Movement.